Keeping your body weight under control and maintaining a good health has become a very popular phenomenon of the modern world. Today people are much more aware of the benefits of having a healthy diet plan and importance of incorporating little exercise in their daily routines. But those who have already put on weight need to follow a regular diet and fitness plan to reduce their weight and bring it to normal. As part of the fitness program, every individual needs to maintain some important charts and documents. These charts and documents may include things like a Diet plan and schedule, the fitness and weight loss tracker, fitness and workout planner and much more. 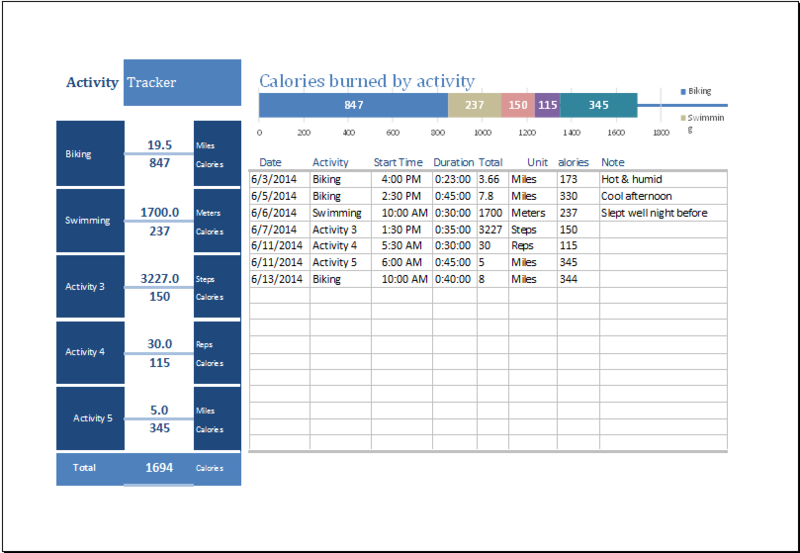 One such fitness schedule or document is the calories burn activity tracker. Like other important aspects of exercise, you need to keep a tab on the calories you take every day. You also need to maintain a close watch on the calories that are burnt through each exercise or workout routine. This is why the calories burn activity tracker is a very handy and helpful document. It will help record the progress of your workout and subsequently show which activity reduces the most calories. It will also help you work out how much and what type of exercise you need on daily basis. It will act as a tracking mechanism for your daily calorie burning process. So anyone planning a fitness program must keep in account this important document.